On Christmas night 2013, 51-year-old Alvis Tutt, a member of the merchandise execution team at Home Depot, had a massive stroke while visiting a friend in Newnan, Georgia. He was flown via medevac to Atlanta Medical Center to receive emergency treatment. Alvis's mother and caregiver, Lillie Tutt, said that his prognosis and chance for survival did not look good at all, as he was in critical condition. To everyone's surprise, Alvis survived the stroke. But it left him with aphasia, and he was unable to speak at all. Alvis began speech therapy with a speech-language pathologist named Patti Bush. She was familiar with Lingraphica and our devices, and she recommended that Alvis try one to see if it could help his communication. 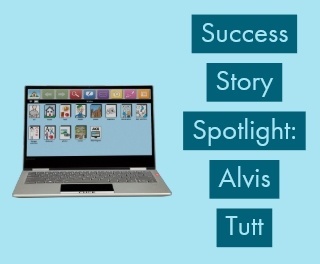 After the trial period, Alvis received his own AllTalk™ device at Patti's recommendation. "Because of the AllTalk, he is able to talk again--he loves this device!" said Lillie of Alvis. "He's doing so much better with his speech, and he uses the device for speech exercises." Although Patti knew about Lingraphica devices, Lillie had never heard of them. After seeing what progress her son has made with his communication, Lillie can't say enough about the device and support from Lingraphica. "It's a wonderful device," said Lillie. "I tell everyone about this. It's great to have some hope now. Even if we have a problem, the customer support at Lingraphica is always great at fixing and returning the device to us. He's come so far...and I think he's going to do even more!" If you or someone you know has a medical need for a communication device like Alvis, Lingraphica offers a free device trial to ensure a good fit! Click below to try a device!